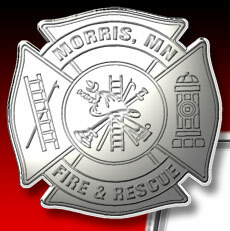 The Morris Fire Dept would like to thank everyone that purchased a raffle ticket for our annual fundraiser! 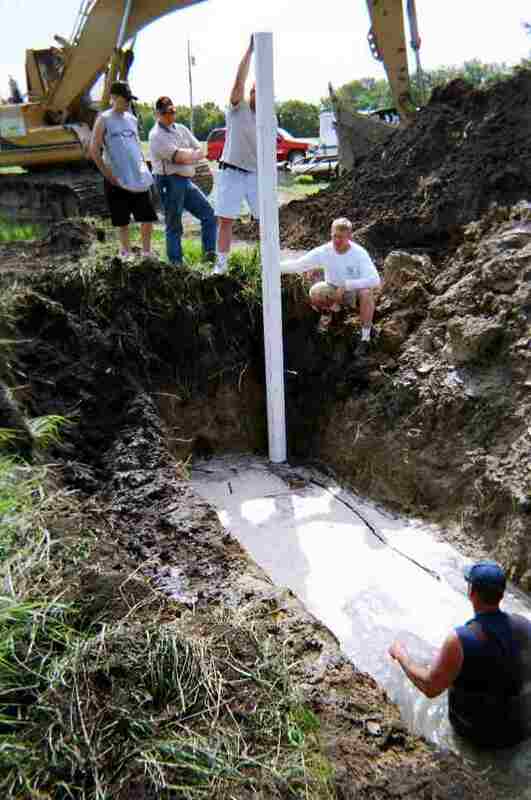 On June 25th several members of the Morris Fire Department and workers from Jim Riley and Son's Construction sank a "Dry Hydrant" in east shore of Lake Hattie which is approximately 4 miles south of Alberta. The exact location is 555th Avenue and 260th St. The main purpose of the "Dry Hydrant" is to have a ready rural resource for unlimited amounts of water for fire fighting needs. This 'Dry Hydrant" is located in the Western Central area of Stevens County and will be a "water supply source" for local Fire Departments from Morris, Chokio and Donnelly that can be utilized when they need water in the immediate area. This will save hauling water longer distances by Tanker Trucks. 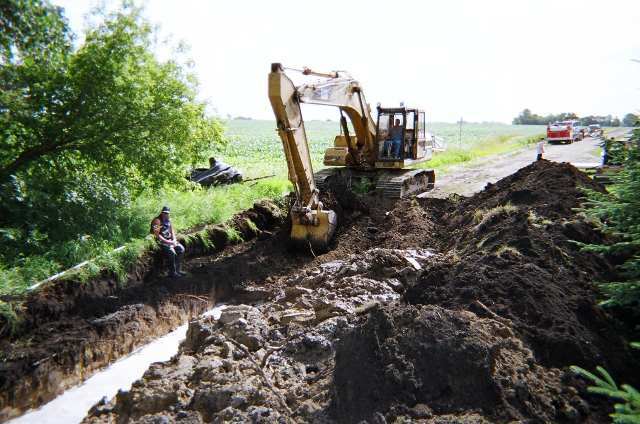 Cory Jergenson digs n 80' trench approximately 12' deep from the shoreline to where the riser pipe will be placed. The term "Dry Hydrant" means that the water supply to the outlet is not "under static pressure" like conventional Water Hydrants. The water in the "Dry hydrant" is at a static level equal to the water level of the lake. The static water level in the pipe is below the frost line so the "Dry Hydrant" could be utilized in the winter too. Firemen in the boat remove the covering over the end of the screen on the pipe, the pipe fills with water and sinks to the bottom of the lake and the trench. To take water from the lake a "Pumper Truck" is needed to draft the water up through the "Dry Hydrant. The water is then transferred through the pumper truck into tanker trucks waiting to be filled. It is estimated that the amount of water drafted would be approximately 1,000 - 1,500 gallons per minute, depending upon the size of the Pumper Truck. Most Tanker Trucks could be filled using this method in 3-5 minutes depending on the receiving trucks inlet system. The "Dry Hydrant" pipe is 6" PVC. It extends approximately 60' from the shore out into the lake. The end of the pipe is in about 5' of water. 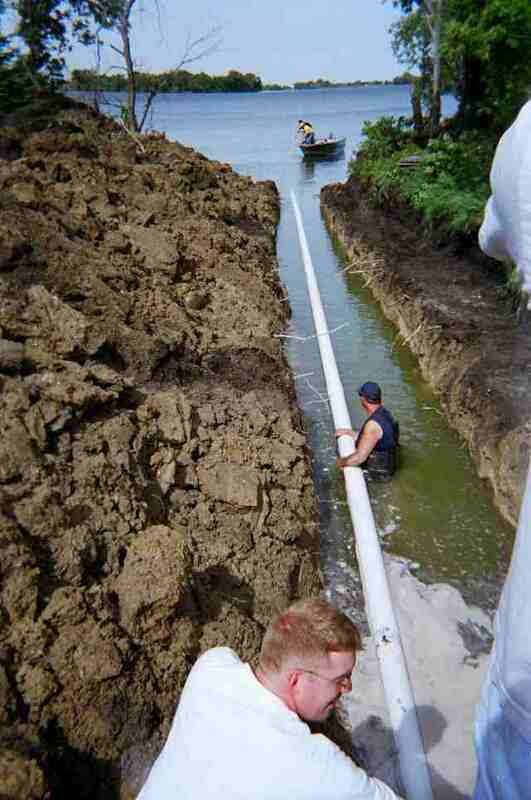 Another 80' of pipe was needed to get from the shoreline to the riser. Approximately 140' of pipe was sunk into the lake and buried under the shoreline and lake bank. With the pipe sunk, the vertical riser is in place and now the trench is ready to be back-filled. This is the second "Dry Hydrant" project in the County that the Morris Fire Department has installed. The other is on the south side of Pommede Terre Lake that will serve the North-East Central area of the County. The residents in these rural areas can feel good knowing that they have a lakes supply of water for fire fighting if ever needed! 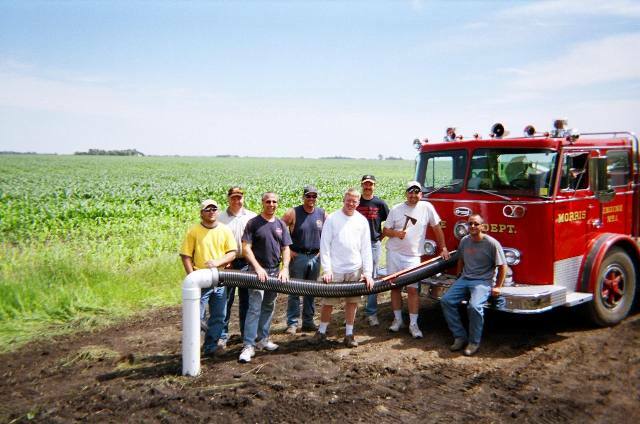 Members of the Morris Fire Department pose at the completion of the project, showing the pumper truck hooked up to the standpipe. These "Dry Hydrants" are for Fire Department use only. Any other use is prohibited. Matching funds Grant was provided by Minnesota DNR. 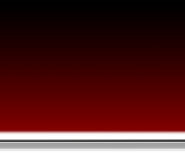 Other funding was supplied by the City of Morris, Morris Fire Dept., City of Alberta, Chokio Fire Dept., Scott & Synnes Townships. Special thanks go to Fire Chief Doug Storck for applying for the grant and coordinating the project & Dean Schmidt from the USDA for his help in permitting and engineering.